Arrive in Nuremburg, where your great Bavarian adventure begins. Be welcomed aboard your five-star floating hotel by the dedicated crew, taking in the air of anticipation and excitement as you explore the luxury surroundings that you will call home for the next seven nights. Settle into your exceptionally well-equipped cabin, then get acquainted with your ship and fellow cruisers while you look forward to a delicious welcome dinner to start your cruise off in style. 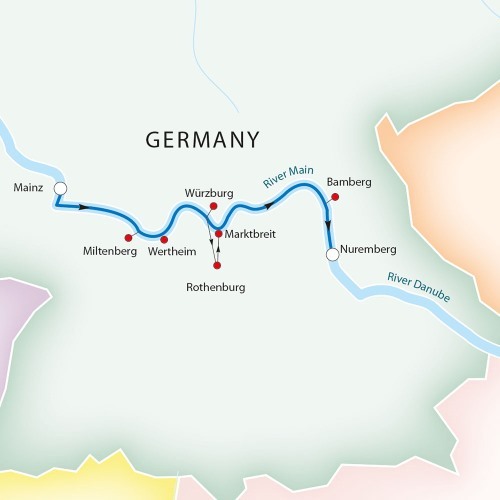 This evening you’ll be served another delectable dinner, and overnight we cruise to Mainz.